Many concepts and techniques have been improved to aid in the product design function. For illustration, several of the methods and principles of Taguchi who is most recognized for his contributions in quality control, as like: "robust design" and the "Taguchi loss function," can be implemented to product design. The topics of simultaneous engineering and design for manufacturing are also related closely along with design. In the current section, we discuss a method that has gained acceptance in the product design community as a systematic method for organizing and managing any specified design problem. The method is termed as quality function deployment. Quality function deployment or QFD sounds like a quality-related method. And the scope of QFD certainly comprises quality. Though, its principal focus is on product design. The objective of Quality function deployment is to design products such will satisfy or exceed customer requirements. Obviously, any of product design project has such objective, but the approach is frequently very unsystematic and informal. QFD, developed in Japan in the mid-1960s, employs a formal and structured approach. Quality function utilization is a systematic procedure for explaining customer desires and needs and interpreting them in product's terms features and process characteristics. The method is outlined in following figure. 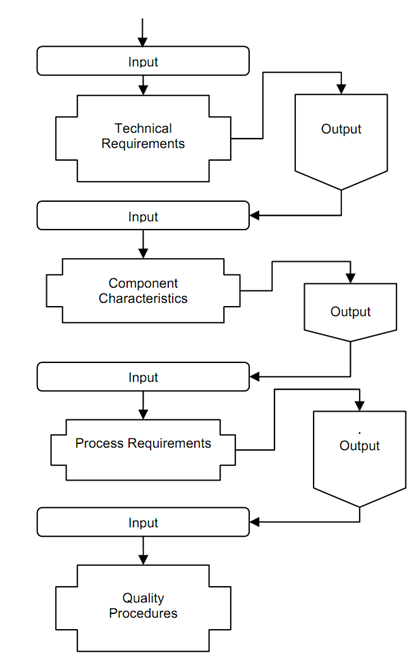 In a Quality Function Deployment analysis, a series of interconnected matrices are enhanced to establish the relationships in between the technical features and customer requirements of a proposed new product. The matrices implies a progression of phases in the Quality Function Deployment analysis, whether customer requirements are first translated in product features, after that into manufacturing process requirements, and at last into quality actions for controlling the manufacturing operations. It must be noted that Quality Function Deployment can be applied to analyze the delivery of a service and the design and manufacture also of a product. This can be utilized to analyze an existing service or product, not just a proposed innovative one. The matrices might take on various meanings depending on the service or product being analyzed. And the number of matrices employed in the analysis may vary also, from as little as one although a single matrix does not fully exploit the potential of Quality Function Deployment to as many as 30. Quality Function Deployment is a usual framework for analyzing process and product design problems, and it should be adapted to the specified problem context. Each matrix in Quality Function Deployment is similar in format and contains six sections, as shown in following figure. On the left-hand side is section 1, having off a list of input needs that function as drivers for the current matrix of the Quality Function Deployment analysis. In the initial matrix, such inputs are the needs and desires of the customer. 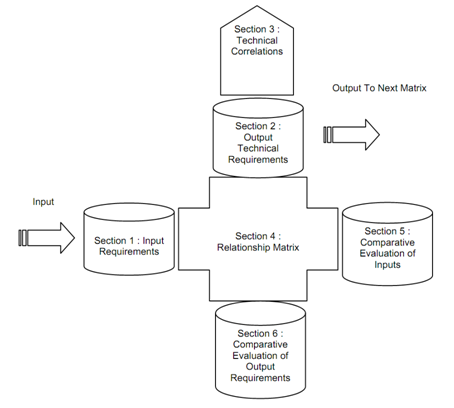 The input needs are translated in output technical requirements, as listed in section 2 of the matrix. Such technical requirements indicate how the input needs are to be satisfied in the innovative product or service. Within the starting matrix, they represent the products technical capabilities or features. The output needs in the present matrix function as the input requirements for the subsequently matrix, via to the final matrix in the Quality Function Deployment analysis. Going on the right-hand side of the matrix is section 5 that is employed for comparative evaluation of inputs. For illustration, in the starting matrix, it might be employed to compare the proposed innovative product along with competing products previously on the market. At last, at the bottom of the matrix is section 6 that employed for comparative evaluation of output needs. The six sections may take on slightly various interpretations for the various matrices of Quality Function Deployment and for various products or services, but our descriptions are sufficient as generalities.